You are cordially invited to a stress-free playdate! Whether you are hosting your little one’s first playdate or their 100th, a little strategic planning can go a long way. The most important thing you can remember when you start your planning is to keep things simple. Playdates can play an important role in your little one’s development. Not only do they provide fun for children, but they also aid in the development of communication skills as well. By interacting with children of similar age, children can learn how to use their words to effectively communicate and problem solve. 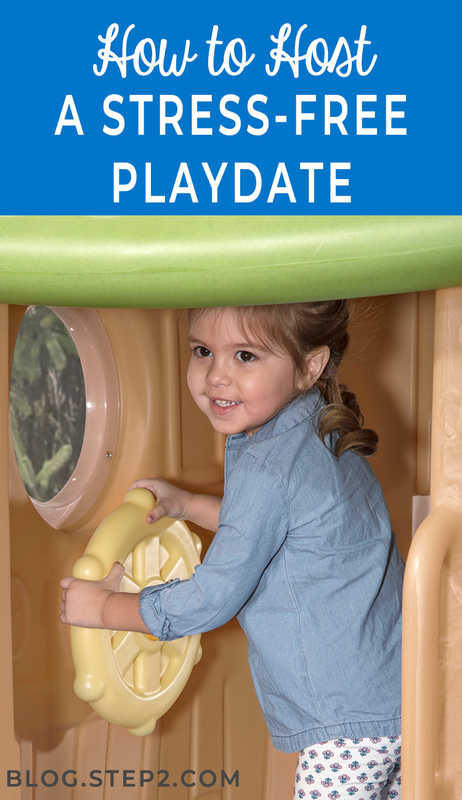 Not sure about where to begin when it comes to planning a playdate? Here is a how-to guide from the Step2 family on how to plan a playdate that will please even the pickiest of children. Playdates do not have to last all day. In fact, having a playdate last between one to two hours is the ideal time frame. It’s important to also make sure the start and end time don’t interfere with nap time (otherwise you may end up with some unhappy guests). Mid-morning and mid-afternoon are both usually great times since children will be full of energy. There is also no need to have an extensive guest list. If you feel that it’s best to only have one or two children over, then so be it. A smaller group can also mean a more relaxed experience for you as a parent! You do not have to clean the whole house just because guests are coming over! If you only focus on the areas the children will be in (playroom, kitchen, bathroom, etc.) you will have less stress leading up to your morning of fun. Plus, without a doubt, there will be a few messes made during the play date. Before the playdate begins, double check that you’ve childproofed the play space for your anticipated extra little ones. Now’s also the perfect time to hide away the toys that you don’t want being out, so there’s less mess later on. Keep the toys for the playdate in the middle of the room to encourage sharing and prevent wandering little ones. It’s also a great idea to encourage your guest to bring their own favorite toy over to share, so they feel more at home. It’s important to have some activity planned for the playdate to prevent total and utter chaos. These ideas can be indoor or outdoor and can include any game or activity you can dream up. If the weather permits, your backyard is often the perfect place to have fun. Climbers are a great way to get children to be active and also have hours of fun. Encourage the children to have a backyard obstacle and see who can complete going up the steps and down the slide the fastest. Letting the little ones play on the swing set is another great and easy way for them to have fun and blow off energy at the same. Nothing is quite as fun for children as getting fresh air and spending time swinging back and forth with their friends by their side. A fun game to play on the swings is rocketship! See who can swing the highest to the moon with the fewest leg pumps. Too cold for outside? There is still plenty of fun for the little ones indoors. Making use of your child’s favorite play kitchen is perfect for encouraging group play. Have the little ones work together and make a meal that incorporates their favorite things. After fifteen minutes, have them present their co-cooked dish and explain how they worked together to make it. This encourages teamwork and creates a truly unique dish! There are so many ways to utilize toys both inside and outside the house to ensure that your playdate is full of fun and laughter. Having snacks ready is necessary for any day of fun! You do not have to get fancy and put out a complete spread, but something as simple as juice boxes and sliced apples can go a long way after an afternoon of playing with friends. Just be sure to be aware of any potential allergies ahead of time! Playdates don’t have to be extravagant. In fact, kids can have the most fun when they’re just being kids! If you remember to keep things simple, everyone (including parents) will have a fun and memorable time.